Tigre is a city, far flung over the bigger and smaller islands in the Río Parana Delta close to Buenos Aires. The people who live on these islands rely on supply boats like this in the picture. 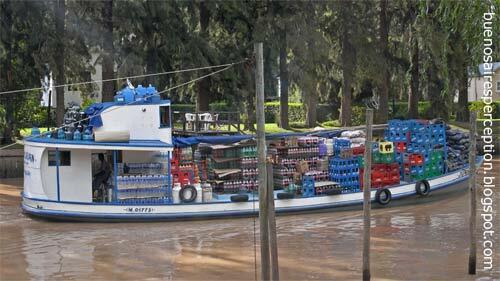 These floating convenient stores crossing the river branches day by day supply the inhabitants with well-assorted goods. That is so interesting. I am quite ignorant about Buenos Aires, thus I appreciate this post very much! That supply boat is so cool looking. Never seen that before.